ac ges charging machin Another two set of evacuation cart successfully installed at reputed AC & Refregeration company in India. Thanks to Quality vacuum Pump from DHVE and System designing capability oF DHVE Team.Many more such systems are under manufacturing. DINESH HIGH VACUUM ENGINEERING furnace High vacuum, high temperature brazing furnace The successful outcome of any brazing operation is that the mating surfaces of the joint are substantially free from oxide films when brazing alloy melts and flows. Vacuum brazing is no different in this respect to any other brazing procedure; oxide-film removal has to be achieved before the production of a satisfactory joint can be achieved Vacuum brazing is not only efficient, cost effective and environmentally friendly – working in a vacuum also allows brazing without aggressive and environmentally damaging fluxing agents. It also makes it possible to do without complex reworking or finishing of the treated components. The lack of flux inclusions in the base material improves its mechanical stability and corrosion resistance, thereby improving its joint strength and the durability of the treated components. 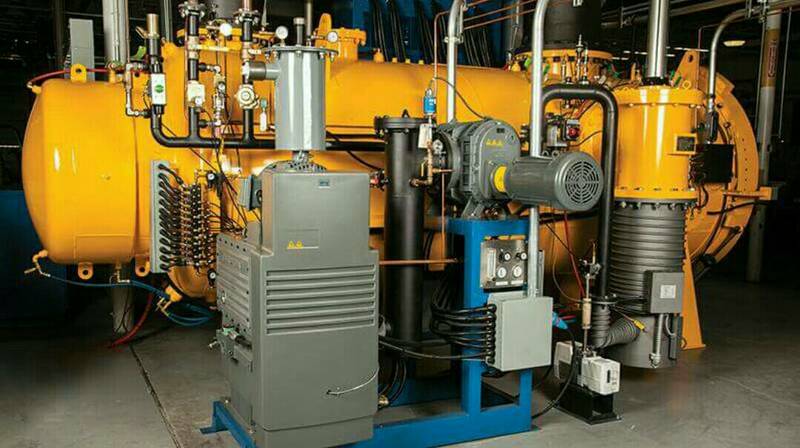 Vacuum brazing with DHVE furnace technology is simply perfect. The advantages of high temperature brazing in fine or high vacuum make it predestined for use in producing joints that must stand up to intense thermal conditions and heavy mechanical loads. The use of vacuum brazed components has become well established in safety-critical aerospace technologies. Whether you are talking about jet engine components and control systems, turbine blades, heat exchangers and heating coils, honeycombs and fasteners, or medical implants and instruments, the list of products that achieve their incredible performance characteristics thanks to vacuum processing is extensive. DHVE has been in the field of vacuum science and technology for over 5 decades offering hardware, measuring instrument, controllers to vacuum equipment with process solutions in vacuum technology with indigenous, but match to the international standards from raw material selection through manufacturing process to demonstrating it for repeatable quality results. The recently made vacuum brazing furnace is a horizontal front loading high vacuum heat treatment with external gas quench furnace is intended to use for brazingofTi alloys, steels, super-alloys, ceramics, etc. It has a water cooled chamber of size 1400mm (Diameter) x 1400mm Cylindrical Length with hot zone size of 970mm Diameter x 1050mm (L). The chamber has been designed and manufactured as per ASME CODE SEC. VIII, DIV. I. and welding by ASME CODE SEC.IX with gas cooling facility. The operating temperature is : 350°C – 1370°C Maximum design temperature is : 1450°C Number of hot zone : 3 Maximum charge weight : 500 Kgs A motorized charge loading trolley is firmly fixed on the guided arms of the fork lift, which has two motions i.e. up and down motion and to and fro motion. · Fork Length : 1000mm · Fork Width : Suitable to the Charge Table. · Lifting Capacity : 600 Kgs. Time to reach maximum operating temperature of 1370°C from the room temperature under vacuum is 120 minutes at the heating rate of 12°C /min. Mechanical booster pump based vacuum system enables to create a ultimate vacuum level of 5 x 10-6 torr.SCADA and PLC based operation automation is designed for user friendly usages.